(A new pamphlet with these revisions was issued during 2013). 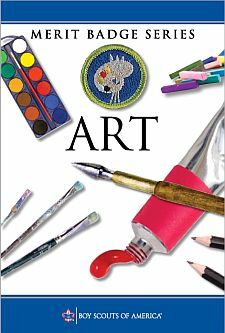 Discuss with your counselor the following terms and elements of art: line, value, shape, form, space, color, and texture. Show examples of each element. Discuss with your counselor the six principles of design: rhythm, balance, proportion, variety, emphasis, and unity. Design something useful. Make a sketch or model of your design. With your counselor's approval, create a promotional piece for the item using a picture or pictures. Tell a story with a picture or pictures or using a 3-D rendering. Design a logo. Share your design with your counselor and explain the significance of your logo. Then, with your parent's permission and your counselor's approval, put your logo on Scout equipment, furniture, ceramics, or fabric. With your parent's permission and your counselor's approval, visit a museum, art exhibit, art gallery, artists' co-op, or artist's workshop. Find out about the art displayed or created there. Discuss what you learn with your counselor. Find out about three career opportunities in art. Pick one and find out the education, training, and experience required for this profession. Discuss this with your counselor, and explain why this profession might interest you.